Stretch marks are visible lines on the surface of the skin, with a colorless hue. Stretch marks are mainly found in the abdominal wall, but can also occur on the thighs, arms, buttocks and breasts. When the skin stretches, the skin’s collagen fibers become weak and cause the formation of fine lines under the topmost layer of the skin. Sometimes stretch marks can cover large areas of the body. There are certain remedies that can help prevent stretch marks and also reduce the appearance of old and new ones. 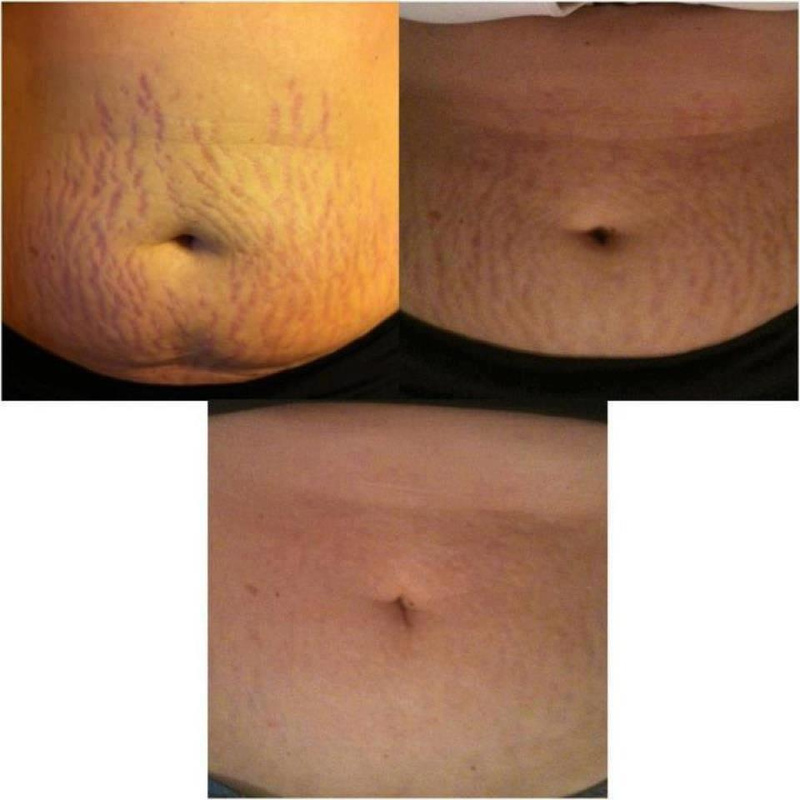 There are many ways to get rid of stretch marks and, usually, a mixture of ways works the best. Within a few weeks, you will notice those unsightly lines lightening and becoming less visible. Remove the outer layer of the aloe vera leaf and bring out the sticky gel from the inside of the leaf. Apply the gel on stretch marks and wash off with water after two or three hours. Apply the vaporub on the affected area and massage for a minute or two. Cover the area with the help of cling wrap and leave this on overnight. Warm the castor oil slightly and massage it on the stretch marks for 15 to 20 minutes. Do this every day before going to bed. Cut open the capsule to extract the oil. Apply this oil on your stretch marks and massage for a few minutes. Leave it on. Apply this oil twice or thrice a day. Lightly warm the oil and massage on the affected area for a few minutes. Do not wash it off. Repeat this twice a day. Mix coffee grounds with water to make a paste. Scrub this well over the affected area. Scrub in gentle, circular motions for three to five minutes. Rinse with warm water and moisturize. You can add a tablespoon or two of olive oil or aloe vera gel for better results. To the almond oil, add a few drops of your favorite essential oil and mix well. Heat for a few seconds and apply all over the stretch marks. Massage in a circular motion for a couple of minutes and let it dry. Mix 1 tablespoon raw sugar + A few drops of almond oil + A few drops of lemon juice to make a grainy scrub. Massage this onto your skin for 8-10 minutes. Wash with warm water and moisturize as usual. After taking a hot shower, pat your skin dry and apply baby oil on the affected area. Massage well so that the oil gets absorbed into the skin. Let the oil dry naturally. This usually takes a few minutes. Apply the oil every day after taking a shower. Mix the baking soda with the lemon juice to form a paste. Apply this on the affected area, wrap in cling, and let it sit for 20-30 minutes. Remove the wrap and wash with warm water. Apply this every day for fast removal of stretch marks. Apply lemon juice in circular motions on the stretch marks. Let it get absorbed by the skin for about 10 minutes. Rinse with warm water. Apply a moisturizer. Repeat this once or twice a day. Pour the apple cider vinegar into the spray bottle. Spray it over your stretch marks before going to bed and let it air-dry. Wash thoroughly in the morning and moisturize the skin. Do this every night before going to bed. • Mix the turmeric with the cream or yogurt to form a paste. Apply this on the stretch marks and let it dry for 10-15 minutes. Rinse with warm water and moisturize. Repeat this twice a day to fade away stretch marks. Cut a medium-sized potato into thick slices. Take the potato pieces and rub it gently on the stretch marks for a few minutes. Make sure the starch from the potato covers the affected area. Allow the potato juice to dry and then wash it off with lukewarm water.